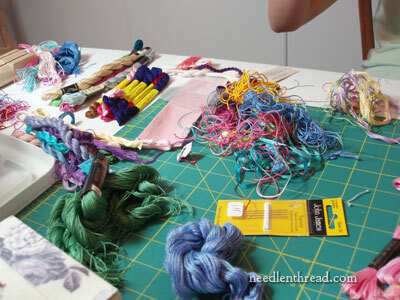 Wherever you do your needlework – whether you have a workroom where all your embroidery projects develop, or you embroider in the perfect corner of your living room – unless you are a Super Organized Person, occasionally, you have to go through that stage that I call “Digging Out” before you can dig in to your next Great Needlework Undertaking. Yesterday was a Digging Out day for me. I didn’t really mean it to be, but that’s just how things developed. My table in my workroom was actually neat and tidy (and practically empty) when I ventured into the place yesterday morning. My plan: to spend the greater part of the day preparing fabric, working out stitch tutorials, photographing, and working up a video. But then I opened Pandora’s Box. Now, why Pandora even has a box in my workroom is a question I will never be able to answer. But she does – and into that box goes all those miscellaneous items – little projects that I might be working on, things I want to get to, stuff I “can’t be bothered putting away right now” and so forth. The box sits at the end of my work table, and as long as the lid is on it, my workspace looks miraculously tidy and I bask under a false sensation of organization. But woe is me when I open The Box! Yesterday, I opened The Box, and the whole day developed into a day of Digging Out. The first thing that happened was that all the items in The Box got spread about on The Table. Before I knew it, I was surrounded by Stuff. Threads starting oozing out of every corner of The Box. They coagulated into great heaps. 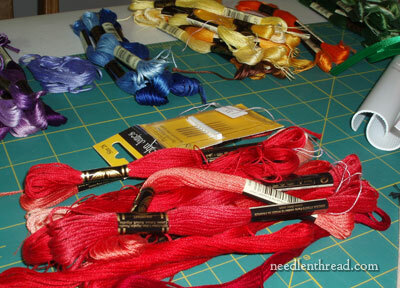 These are the threads I use to work up stitch tutorials, and sometimes, when I’m in a frenzy of photo-taking or video-making, I just heap the threads together, intending to sort them at the end of the session. But then I drop them in The Box. … and the table top became visible once again. Finally, at the end of the day, when everything else was sorted out and put away, I got down to business and set up some fabric and frames. The moral of the story: Entropy Happens. But that slow decline into disorder that is entropy only happens because I let it happen. So here’s a hint for organization, if you have a similar problem: if you have a “Hot Spot” where your supplies or projects tend to gather in disorder, tackle it for just five minutes at the end of every day. For me, the Hot Spot is Pandora’s Box. I know if I spend 5 minutes at the end of a work session or a work day making sure that everything in that box is actually sorted and tidy, then not only do I stay organized in other things, but in the long run, I save a lot of time and the time I do have is used more efficiently. Eventually, that 5 minute bout of organizing becomes habit, and life is much better for it. This is my resolution this summer: to re-develop my habit of addressing Pandora’s Box at the end of each day’s work. Do you have any tips for organizing your workspace and keeping it organized? If you do, share! We can all benefit from a good exchange of ideas on organization – after all, you never know whose life you might improve by sharing your own organizational tactics. Feel free to have your say on the subject by leaving a comment below! And now, I’m off to make for lost time! August 6, 2014 Embroidery Work Space, or Where IS Waldo? My “box” is a lot bigger than yours-it’s the guest room closet! It’s horrid and I’ve been putting off emptying it out and organizing it. I have WIPs in there that haven’t seen the light of day in almost 2 years. So you’re doing well with that one box! Boy did I feel a lot better after reading this. So nice to see you “put it out there”, when I thought this was one of my “dirty little secrets”. Bless you. Here I enjoy reading your daily message – and then you come along with this one, inflicting a bad conscience – and that not only concerning one Pandora’s Box but a whole house full of them. Please treat us to something more pleasant (and less pain-inflicting!) tomorrow and every day thereafter! LOL! That’s it! You used your One Time, Hanny! pray really hard that it doesn’t rain! I have a bag for every type of needlework. I have a tatting bag, crochet bag, embroidery, knook bag, etc.Ikeep my floss in a plastic container with a handle and compartments.When I complete a project, I get the bag ready again for another. If I don’t have time, I can grab a different project bag. This way, I can grab any bag for the car and take my 3 kids where they need to go. That is such a neat idea, your Pandora box. I will try that to keep the clutter off the work surface. A Pandora box, a have a lot to ordered! Ha-ha-ha! I am not brave enough to show you my workroom and I should “practice what I preach”, but my suggestion would be to get a smaller box! This will force you to spend time with it sooner rather than later just in case the 5-minutes-at-the-end-of-your-day, extremely organized left brain is overthrown by the fun-loving, chore-avoiding, Scarlett O’Hara, right brain! My room has a large drafting table, then I decided to add a folding card table. Now its job seems to be to hold things for later. One neat table, one well in another state than neat. The one good things is I have two cats, thread must be put away! I buy large zippered purses at sales and keep a few with projects ready to go. Zippers, love them, keeps things in and cats out. I am glad to see this is not just me. I have to do this each time I shift gears or move from project to project. Thanks for sharing. I try and hide mine. Your post made me laugh! i am not a very organized person but my young daughter is. She is takling my Pandora’s Box which is actually a room! I just pile stuff up in there and it has taken a life of its own. Thank goodness dd is trying to organize for me. (She is only 12.) For a reward I will pay her way to my local guild’s workshops on needlefelting which she enjoys. My “box” is actually the end table next to where I stitch. I opened it the other night for some bobbins for winding some new floss and things kind of gently cascaded out of the end table. I gently shoved them all back in again. 🙂 It’s on my to do list when I have a breather after the current project that must be done by Friday. OTOH, most of my stash charts are organized in binders and my floss is on bobbins in floss away baggies (along with extra skeins). The baggies are kept in file boxes in numbered sequence. DMC has their own set of boxes, as do Caron and each brand of silk. Beads are kept in watchmakers cases in numeric order. Boy do I know about Pandora’s box! She keeps a couple at my house too. May I suggest putting the lid somewhere inconvenient? If it’s not on the box, it’s much more difficult to pretend the mess doesn’t exist. I was impressed with the first photo. I could see portions of your table. I am working on a Christening gown and my whole house looks like an explosion took place in a lace factory. I am so looking forward to finishing this project so I can clean. Then the mess begins again. Thanks for inspiring me–to sew and to clean up. Great idea! I love your Pandora’s Box idea and plan to incorporate it TODAY as I’ve assigned org my organizational duties to my sewing area today. I find it difficult to work when room is in disarray and this will contain it to one (disguised) place! I have finally assigned different boxes/containers to “Hand Sewing” or “Quilting” or “Beading” or “Framing” so that I could find specific tools, but there are always those ‘gadgets/things’ that are cross-overly useful! Now what to do about them? I’m so glad to see this! My work area is in my living room and my storage area is in my spare room. When I’m in the middle of a project, my desk looks like your table. I tidy as often as possible but long for the day when I can have an area committed to my stitching, with lots of shelves and surfaces. Sorry, you’ve touched on ‘blank canvas’ syndrome for me in this one. I’m anxious for the tips. You’re post reads like a Calvin and Hobbes comic. Inanimate objects spreading themselves around and…WHAT WAS THAT?! Something under the worktable isn’t drooling is it? Are you sure you put EVERYthing away? Just got up for the bathroom and, wanting to see what you had for us, am using the computer in a dark room. Shoulda gone to the bathroom first instead of eagerly…OOHhhh, I’M OUTA HERE, but thanks for the inspiration to think tidily. Cheers, Kath. i recently came up with an idea that is still a work in progress but it IS progressing…lol. i bought a pack of 10 banker boxes. i’ve put them together and have them labeled, i.e., floral, ribbons, xmas, xstitch, decorative boxes, etc. every category of things i do. plus i have one designed to hold small pieces of fabric (under one yard) i wrap the fabric around a piece of cardboard and file it in the bankers box on it’s side, like it’s on a bookcase. i’ve also placed more banker boxes that hold patterns, charts, craft books, craft magazines and place them on their side on a steel shelving unit. it’s like going to a book case, but it also has the ability to be packed up at the drop of a hat; simply pop a lid on it and move the whole box. is this a foolproof way of becoming and staying organized? i have no idea….but it’s a start and only time will tell if it’s effective. at least, when i begin to work on a project, i have only one location to go to to look for supplies and/or tools of that craft, instead of having to dig them out of whatever cranny they’ve migrated to. i also recently acquired a grab and go container http://www.joann.com/creative-options-grab-n-go-rack-system-lime-periwinkle/prd62102/ in it i have placed everything that used to accumulate on the table in front of the couch where i sit and do things while watching tv. it has three drawers/boxes and one section under the lid. in one box i have xstitch items, in another i have hand embroidery items, i.e., hoop, floche, etc., in another i have knitting needles and crochet hooks. and in the section under the lid i have whatever else happens to be floating around, a book with a pattern in it i’m looking at, bits and pieces of something else i’m thinking about…but at least it’s off the table and not falling all over the floor. I always find that I need to do a major put up after completeing a big project whether it is embroidery or making a garment. Most of the time 30 minutes or a hour does the majority of the putting up but every so often it takes most of the day. I need to follow your plan of a 5 minute put up at the end of the day. Oh Mary! You opened more than Pandora’s box here with this story. I decided to open the lids of some boxes that had kits in them from when I used to do handpieced quilts. I got tired and set them aside opting for embroidery along with some form of applique. 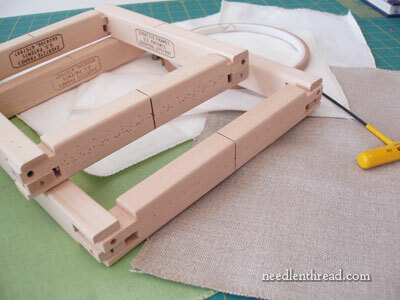 When we are talking kits we are talking from 1996 – 2000 – in fact all had one or two blocks made from them and when I tallied up what I had paid for them and the finishing fabrics I have forced myself to eliminate them one at a time. I will never do this again. I also keep Pandora’s boxes and would not want anyone to see my little corner of the sewing world. 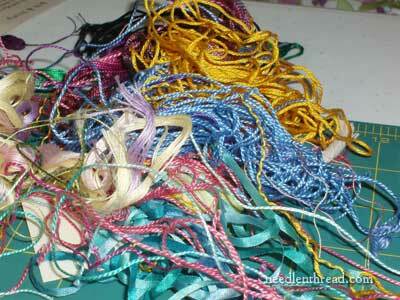 I do have them all sorted by ‘ on wheels containers ‘ stackables for threads – beads, lace – linens etc. and now due to lack of wanting to just toss aside over two hundred dollars per kit for that many years have forced myself to finish some of the blocks and rotate them with my regular work………… it is rewarding to a degree and very boring in another. Know your limit and plan accordingly. Myself for example, I have so many simmering projects that if I allowed myself more space to store and stitch it would be a nightmare sized stack of unfinished and not started projects. I know that if I had a “workroom” or even a specific table or space specifically for needlework, it would, in short order, look like the home of a crazy cat lady. Not infested with felines mind you, but out of control, so I have specifically limited myself to, part one, my grab and go project basket for my projects, I cannot start another until there is room inside. Part two is a divided container for floss bobbin “leftovers” from previous projects. Part three is a four level accordian type sewing basket for floss that is still in skeins. Part five is the drawers of my treadle sewing machine table, where I store extra tools and knick knacks. Having so limited a space, for me, guarantees that I clean up 100% before I call it a day and that (ultimately) I can spend more time stitching, and not loathe the mess (assuming cat-lady workspace) I would have to endure to enjoy it. Which of course having to endure that mess might make stitching less enjoyable in the long term. Organizing is so hard but so critical. I can’t work if I can’t find anything. 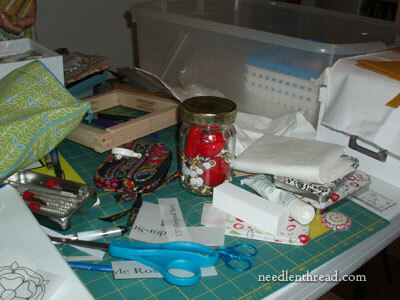 My Pandora’s box is a deep basket on the end of the sewing table. I am fortunate to have a new studio and I don’t have all the storage issues worked out, but I do tend to keep each project in it’s own shallow basket with all the supplies I need for it. I also have a bunch of those roll around plastic drawers. I buy them when they are on sale and use each tower for a catagory, one for yarn (two actually)etc. I also discovered those pop up laundry hampers when I was moving. For $3 a piece, they are a great place to store fabric and yarn…. Hi, Eileene – those are Evertite frames. They’re great! You can look them up using the search feature here on the website… I’ve got a review of them, as well as a tutorial on how they’re used. I love them for small projects! Boy did I laugh when I read this. One question, now that you have finished yours would you mind to come and do mine?? I too have a dedicated sewing room and that 60″ desk just collects too much stuff. I figure if I downsize the desk and keep the sewing tables clear my creative juices will flow more freely. The real problem is priorities. Working on one project, then someone calls with a request for a just this “one little thing” and it jumps to the head of the line. So, now there are 2 projects in the works and all the accompanying bits and pieces needed to complete them. Ah, such is life. Keep plugging (stitching) away. Boy, do I ever need a Pandora’s Box… but knowing me, I’d better start out with a steamer trunk. I’ve been using the guestroom bed…spreading things out so I could see them and get to them “when I have the time”, but then we’ve been having guests lately and that won’t work anymore. Guess I’ll have to grab a big lidded box next time I’m at the store… one too big to hide under the bed (there’s yarn under there anyway) and too big to ignore so it will keep yelling at me to take care of it. Yup…I know that box – I tend to fill it and then put it ‘away’. Unlike Pandora, I am not tempted to open it once it is out of sight and I know I have Stuff that I should put away properly or otherwise deal with. I like your idea of hitting it daily, even though a weekly dig out is more realistic for me. Keeping my Pandora’s box out in the open and not very deep is a constant reminder to me to put stuff away when I pop into my sewing room. If I just put one thing away here and there, it never really gets too far out of control. I also like the bag-per-project-type idea! Hi, Mary. Oh, how familiar. I know myself well enough to know I am NEVER going to take 5 minutes at the end of the day. But I have somewhat mitigated the problem by having a Pandora’s Basket that is small enough to overflow relatively quickly. And that is when I organize. I moved a year ago and am still finding boxes of total chaos. I sew, knit, dress dolls, do beadwork, sometimes embroidery. It helps me to sort into 3 or 4 categories. Laundry is kitchen, bathroom, bedroom. A box would be knitting, dolls, office supplies and beadwork. The bills and some “federal case” (literally) documentation has to go in the hanging file folders. I have now made a file for picture ideas for embroidery. In the sewing area, fastenings, ribbon, trim, lace go in clear plastic bins in a closet. Left out, they will fade in the sun! One such bin has a beadwork memorial jacket in pieces. I can’t wear it, so it will become a wall hanging. For now, it’s together and protected. 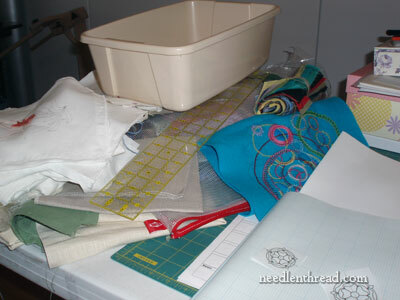 Another bin is all the embroidery supplies, fresh fabric, thread for a project, some drawings. More containers hold bits of lace, antique linens that might make a doll apron or bodice. Buttons are in a Chinese wedding basket with three layers. Tiny antique doll buttons are in a tin. Some of what I’m finding should be put in a collage: Klippies, garters, cartridge pens, a plastic template once essential to word processors . . . I came across some modern white synthetic lace that may be great put in a large quilting hoop, decorated a bit and hung up to hold dangly earrings. When I used to work with sensitive information in the financial industry I learned to put everything away at the end of the day and lock it up. Even when my job changed to less confidential materials I kept the habit just because it feels a lot better to have some closure at the end of the day. And each morning you start with a clean desk. It took me quite a while (like a year) to get my sewing stuff organized sufficiently so that every item has a place to go at the end of the day, but it is so worth it! I was very inspired by a story about how kindergarten classrooms are organized so that everything is stored where it is used. It helps a lot! Every couple of months I have to modify the plan a bit, as new stuff comes in. All crafters have this issue, but I think with quilting especially organizing the stuff is half the battle. I solve the problem by having a very small “Pandora’s box”. It is a pretty little basket, so small that it doesn’t hold very much. It is also open so I see the contents all the time. Those are two good reasons to make me have to deal with it often! My first job this morning was cleaning up the creative mess I had left everywhere yesterday so it felt good to read your article as I had just finished (well almost) cleaning up. I have several pretty boxes (the kind you buy to put presents in) that I put individual projects in but sometimes it just seems that out of sight is out of mind. I am currently expecting a grandchild so of course started several projects. The next couple of weeks are aimed at finishing them all which will indeed tidy up the place. Oh my – you’ve definitely opened a huge can of worms with this one! Now that I’m confined (supposedly) to the second bedroom in our apartment (and must share it with the computer and the cat) I am forced to tidy up more often. My Pandora’s Box is the pull out couch, which tends to be the depository area for everything I can’t be bothered putting away. Of course it’s right in the first sight line for anybody coming to visit! My norm is to create away until I’m hemmed in and down to about ten square inches of work surface and then have a grand shovel out. I have made numerous resolutions to myself to put away as I work, along with the ‘put 5 things away every time I leave the room’ and the ‘spend 15 minutes a day putting away’. None of them has stuck! Hi Mary, Have you been looking into my sewing room thinking “This girl needs help” and then writing your column. I will start a Pandora’s box today after working on my embroidery. Thank you Thank you Thank you. Hello Mary, hmm the dilemma of a needleworker, we all have our ways of stashing something, I had the pleasure of my sisters company for two weeks, during which she sorted my workroom out for me so nicely as well as all my “Bags of UFO’s”, needless to say I now have plenty of doubles in threads, they too are organised into numbers to be used before I go back and buy some more. I try but am not too successful in keeping chaos from happening, its so easy to find a bag to put things in so that it looks tidy, then carry on to the next project, I promised my sister to keep it tidy and to get most made up……one day!!!!! Sometimes I put projects in fabric lined baskets, and some are put in plastic bags. But many are just lying about getting to know each other. I’m happy if I can find a 2 ft square area on my sewing table next to the machine. A box!???!!! Oh no. My “box” is more like a closet. I’d better get sorting. Thanks Mary I am going to try to follow your lead. My Pandoras box grows larger each project I start. I am realy good at geting things out and starting, but fall in the most awfully deep hole when it comes to tidying up. 5 minutes a day soesn’t seem to much to ask and may save me a lot of time in the long run, so I’m going to give it a go, even it it just means picking up a magazine or a few threads and putting them away as I go to bed. First of all I love to read your articles. Always amusing and so true. Unfortunately, I have no recommandations for the organization of all the stuff. By refurnishing my livingroom at the moment several of Pandoras Boxes appeared in my flat. No, I am sure, Pandora secretly took over my flat. I am now on the point of rearranging from one box to another and so on. As I am stitching, knitting and drawing you may can imagin – no, no you can’t…….LOL – 3 possibilities: 1st I perish, 2nd I get a bright idea soon or the 3rd I move to a bigger flat….or I give up my hobbies – oh my god. One question which interests me a lot. Do you have a bad conscience by throwing something out? Regards from Germany! Okay, I’ll own up: I really don’t need Pandora’s boxes – I’ll just rename my house PANDORA’S HOUSE! My “box” is a little unusual in that it takes the form of a 2-seater sofa. I managed to pile so much stuff on there, that I then start piling stuff on the floor in front of it! Why can’t I just sort it out?? I have something resymboling your Pandora’s Box, the husband calls it the “gottado shelf.” I have the books I am using as reference at the side marked with thread as to what and where I am using them, an old tea cup/saucer thing fir thread cut offs (I give those to a friend who has birds and he tosses them out for thir nests), an electronic frame with photos of my current project inspiration (and the grand kids, of course), and a tv romote lazy Susan with scissors, pens, hem measuring tool, and any other gizmo that I need for the current three or so on going projects. I make sure to put everything where it belongs on the gottado shelf when I go to bed or stop for the day. I have a reasonably sized studio – about 28 feet long and 8 feet wide (sounds like a train carriage doesn’t it?). My darling built in shelves and drawers and spaces for fabric boxes, a kitchen sink, benches at sitting height, benches at standing height, ironing station and cutting table. It is truly amazing what he managed to fit into that space. There are no windows in the walls because the aspect is wrong, so they are in the roof which means there is heaps of daylight. Now wouldn’t you think with all that I would be able to keep it neat and tidy? You would. I would. But I don’t. At the moment it is the worst mess, so bad I don’t know where to start. Help! One Pandora’s box just isn’t going to cut the mustard here, I need more. Pandora keeps a few boxes at my house also. And I think it’s been joined by Fibber McGee’s closet. Previous Previous post: Beginner’s Guide to Goldwork – Book Give-Away!